Efficient. Everything got checked. Good relationship with patient. Dr. Rosin is always wonderful. Love that we can always get an appointment & never have to wait long. My kidscan't imagine going anywhere else. 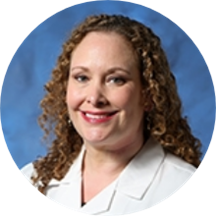 Dr. Melissa J. Rosin is a board-certified UCI Health pediatrician whose clinical interests include pediatric dermatology, allergies and asthma. Rosin earned her medical degree at Pennsylvania State College of Medicine in Hershey, Penn. She completed an internship and a residency in pediatrics at CHOC Children's Hospital of Orange County. Rosin knew she wanted to work with children ever since she was a teenager working as a camp counselor during the summertime. Now she has the opportunity to work with children of all ages. “I enjoy getting the chance to provide care for kids from infancy through their teenage years,” Rosin said. “I love the bond that develops with the family.” She maintains two divergent concentrations in children’s health – she enjoys working with newborns and has a special interest in dermatology. In her spare time, Rosin works out and leads a healthy lifestyle, and said she tries to instill those values in her young patients.